Yesterday we went for a long drive in the sunshine. 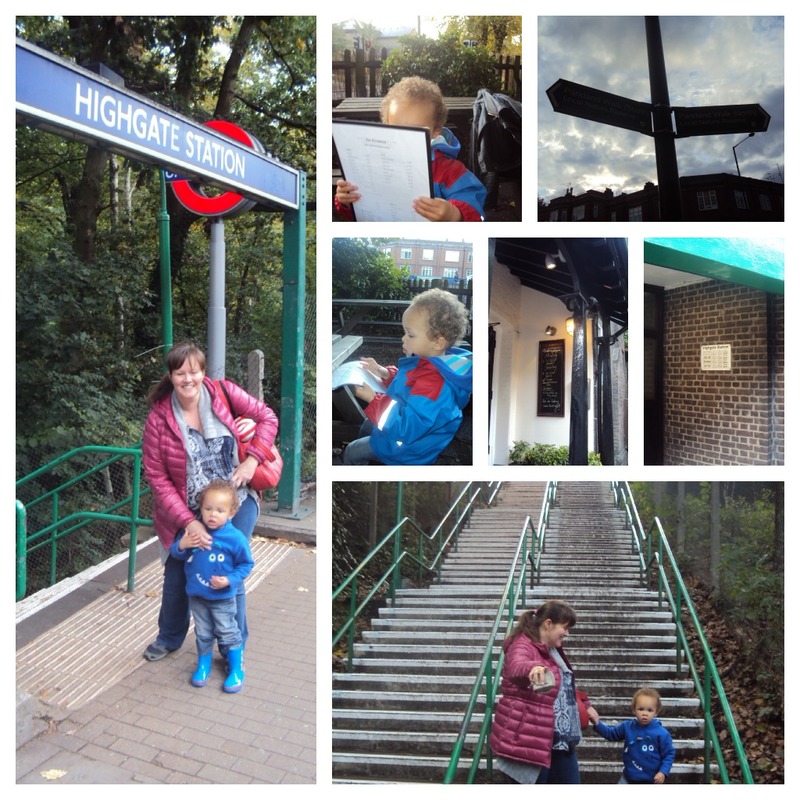 As the WHOLE of London appeared to do the same thing, it took us two long hours just to get from home to Highgate but as it coincided with Aaron's nap he slept for the majority of that, and then had a great run around when we got there. 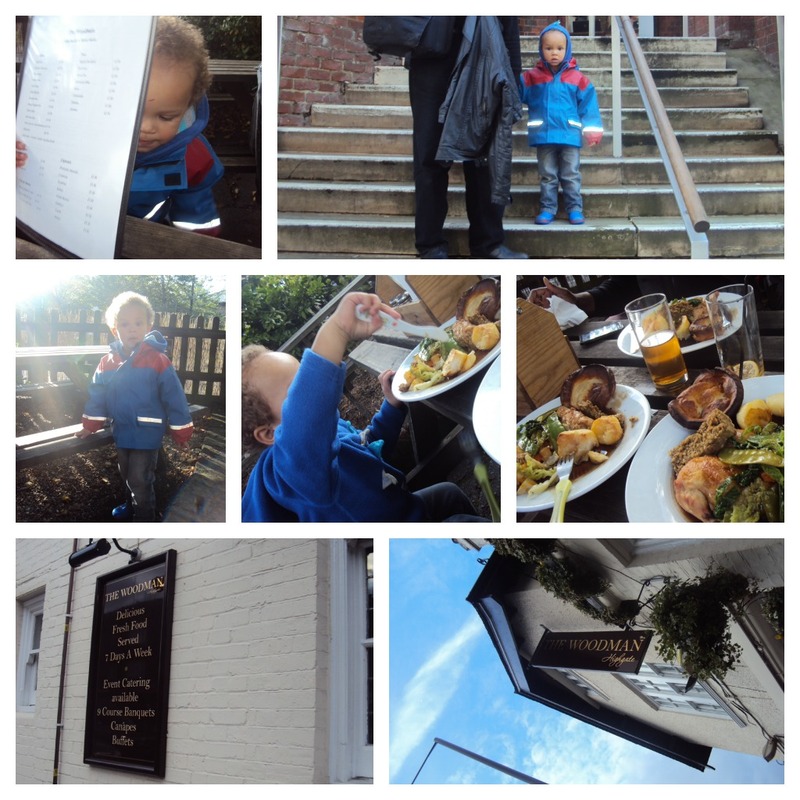 After being intrepid and roaming the area, we ended up in the beer garden of a posh pub: The Woodman. The majority of people were inside so Aaron was able to run around and play with a twig without too much disruption to other patrons. I'd highly recommend the garden if you have little ones. Yes there is no outdoor play area, but there's plenty space for freedom. The roast dinner was around £14.50 for each of us, and I think we paid £6.50 for Aaron to have a miniature version of the same. Thanks to drinks and a starter it still somehow came to £46 (an expensive lunch). I was a real fan of the miniature roast being on the menu as I hate the fact that restaurants assume that a 2 year old can thrive and grow on chicken nuggets and chips, but I had egg on my face with Daddy, when he barely touched it. He was so excited to be eating outside he just wanted to be adventurous so he was running in between tables or climbing on the low wall, or looking at 2 dogs that were with people at other tables. Daddy got really cross when he raised the twig he'd found, above head height so I had to keep leaving my meal to monitor him. The twig was so large it was a branch really (but as slim as a twig). Aaron loved the freedom, and I enjoyed watching him, but we did both want him to eat. But I don't know what it is with 2 year olds; they're not always hungry when you want them to be. My fondest memory of the day is Aaron pretending to read from the menu... he was rather convincing, even reading out things he'd heard us order. Great memory this kid! Mmm, the roast likes yummy! What fabulous day. Did you have Aaron's uneaten food wrapped to take home with you at least?